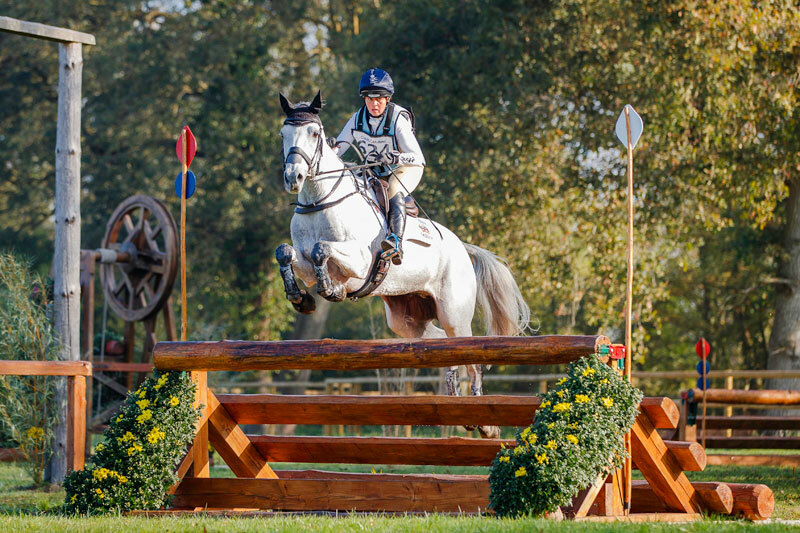 The Irish Sport Horse Studbook won the overall title for the second consecutive year at the FEI WBFSH World Breeding Eventing Championships for Young Horses 2018 which drew to a close at the Haras National at l‘Isle de Briand in Le Lion d’Angers (FRA) yesterday. The title is decided by the best three scores of each Studbook in both categories, and it was the performances of Emerald Jonny ridden by Great Britain’s Piggy French, Cooley Moonshine with America’s Elisabeth Halliday-Sharp and Universal Cooley with Britain’s Camilla Millie Dumas that decided the result when these three finished second, third and fourth in the 6-year-old division. The combined score for the Irish-bred horses was 79.5, giving them almost three points of an advantage over the second-placed Selle Français Studbook while the KWPN Studbook of The Netherlands finished third on a score of 102.0. There were 25 Irish horses representing eight nations in the two categories, but it was the Selle Français gelding Cristal Fontaine that claimed the 6-Year-Old title for Britain’s Kitty King while the Brandenburg mare, Asha P, was steered to success in the 7-year-old class by Germany’s Ingrid Klimke. King and the French-bred grey owned by Alex Wakeley posted a score of 25.4 for third place on Dressage day and never faltered. America’s Halliday-Sharp and Cooley Moonshine were the dressage leaders ahead of Dumas and Universal Cooley in second while British compatriot, Piggy French, sat in fourth spot going into cross-country day when the 20-fence track presented relatively few problems. However single showjumping errors cost the top two dearly yesterday, dropping Halliday-Sharp to third and Dumas to fourth while clears for King and French saw them claim the top two places. King (36) is an Olympian and a veteran of multiple Young Horse Championships at Le Lion where she previously finished third with Zidante as a 6-year-old before returning to win the 7-year-olds with the same horse the following year. She was filled with emotion yesterday when she realised she’d done it again, and was mighty proud of her lovely grey gelding. “He’s just tried really, really hard. I always said to the owner he was as good as Zidante…..and I’m just chuffed to bits with him. Millie (Dumas) and Liz (Halliday-Sharp) are on really good jumpers, I know what their English form is like so I would have been delighted to just finish third on my dressage score. It’s wonderful, I’m so pleased for my team at home, my sponsors and especially my owners,” said King. A total of 40 horse-and-rider combinations started in this category and 36 completed. In contrast to the younger horses, the 7-year-olds found the cross-country test set by master course designer Pierre Michelet much more challenging, with 19 different horse-and-rider combinations racking up penalty points including three that retired and seven that were eliminated. A total of 69 started in this category, and 56 completed. Newly-crowned team and individual world champion, Great Britain’s Rosalind Canter, made it all the way to fence 20, four from home, before her Irish-bred Rehy Royal Diamond collected 20 penalties for a refusal. Well down the line in 17th place after dressage she finished 44th in the final analysis, while dressage leader, Germany’s Michael Jung, was eliminated for a fall with Chocolat at fence 8 which left the three-time Olympic gold medallist with a shoulder injury. As a result second-placed Klimke and Asha P rose to pole position when cruising round the cross-country track well inside the time-allowed of 9’14”, but going into yesterday’s final phase they had only 0.3 of a lead over Britain’s Nicola Wilson and JL Dublin who posted the second-quickest cross-country time. However a fence down yesterday saw this pair drop to fifth and it was Great Britain’s Tom Jackson with the Irish-bred Capels Hollow Drift who slotted into runner-up spot behind Klimke and her bay Brandenburg mare who never put a foot wrong. Third place went to Astier Nicolas from France with Babylon de Gamma (SF) and Belgium’s Karin Donckers and Leipheimer van’t Verhah (BWP) finished fourth. Double Olympic and double World Championship team gold medallist Klimke, who clinched individual bronze with SAP Hale Bob at the FEI World Equestrian Games in Tryon, USA last month, was delighted with her result. “It’s my third win at the Mondial du Lion and the happiness is still the same! I love more and more bringing young horses to top level, and winning here is really important. My mare is really good and I believe she will easily rise to 3-Star level. I have no doubt she will step into Hale Bob’s shoes,” said Klimke.